Had a lovely week hanging out in the home of country music, Nashville for the Digital Retail Transformation Assembly. As my first event for my new company, I was super excited to see what our products look like in real life. 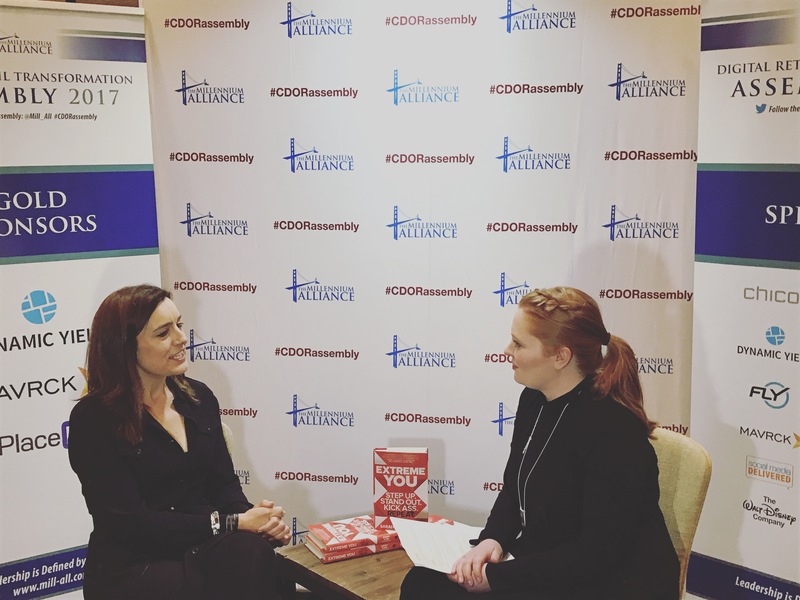 I had the chance to also sit down with a marketing hero of mine, Sarah Robb O’Hagan, who has just written a book EXTREMEYOU. But what was also great was the conversations that delegates were having. There were 7 key trends that the marketers in the room were keen to discuss. As the digital retail landscape continues to grow, it is important not to forget the in-store experience for the consumer. Connecting the digital experience into the physical space, by bridging the physical and digital divide. In other words, the Phygital is now an imperative for many retailers. Retailers are searching for innovative technologies to bridge the digital and physical worlds. There are many new companies out there looking to help retailers merged their digital and physical realms into one. Leading retailers have invested heavily in physical locations. But today, every business must also invest in delivering a rich online experience. Today’s consumers are more tech-savvy than ever. They don’t just delight in seamless omnichannel commerce, they expect it. Some enterprise-sized brands forget that shoppers are humans, not just segments. Not only do retailers need to merge the digital and physical, they also need to think human. Companies that succeed in marketing to the individual will thrive, those that don’t are destined to fail. It can be difficult for large companies to shift quickly. Nobody does it well, and consumers don’t care about your legacy platforms or IT roadmaps. They care about personalized experiences and getting access to the most relevant digital content. Potential customers interact with a brand on multiple channels. We are “data-reach but knowledge-poor” (Sarah Robb O’Hagan). The explosion of digital has enabled businesses to gather an extraordinary amount of data. What’s missing is the knowledge on how to use it. Retailers consistently adopt the latest technology but do not take the time to investigate how it adds value for the consumer. Take location data for example. Mobile means more of today’s brands are empowered to gather in-depth insight into the true customer journey. Innovative brands are embracing location data. Our sponsor PlaceIQ led an extremely popular workshop during the Digital Retail Transformation Assembly, They were key to emphasize the power of this data if used right. Location data has helped brands to make holistic marketing decisions, which have led to creative marketing plans built on customer behavior. Storytelling is a huge trend, not only in retail but in marketing across industries. New digital channels have not only provided an unprecedented amount of customer insight but also present a unique opportunity to personalize experiences. What is vital to remember is that brand purpose is still as relevant as ever, especially when you consider the consumer desire for authenticity. Understanding and delivering content that really connects with the consumer is critical to marketing strategy. Storytelling is more relevant than ever. There is no debate on who owns a story, only on who has adapted their business in a way that delivers truly integrated and effective real-time experiences. Clients who want this level of integration and simplicity, look to brands who are using data to understand what content they want and deliver authentic stories to engage with. Delivering unified brand experiences is heavily linked to the previous trend, Phygital. Marketers must deliver a unified brand message across multiple channels, including in-store. With digital tools, it is possible to change and deliver messages directly, in a quick way. At Digital Retail Transformation Assembly, the unified brand session leaders emphasized the importance of authenticity. Marketing according to the dictionary definition, isn’t authentic. Brands try to position themselves in the best light, omitting the negative and do everything they can to woo consumers. In this age of unprecedented consumer empowerment, where the reality of products and services is just a Google search away. In today’s marketing landscape, consumers trap brands who fail to be authentic, or as is often the case, fail to unify their brand message. The definition of mobile is changing, expanding past the apps you have on your phones or tablets. Mobile is about the user, and understanding how their physical environment and digital technology interact. Leading businesses are getting closer to their end-user by leveraging technology to create contextually relevant and more personalized experiences. Social media is a vital tool for retailers. It can be used in multiple ways. Influencer marketing has made a huge impact in retail. Americans spend 1.8 hours per day on social networks, which is more time than on personal email and search engines combined. As a result, we’ve become a society whose purchase behavior is heavily influenced by those we choose to connect with online. We’re also a society suffering from ad fatigue, ad fraud, and ad blockers. When people get overwhelmed, they tend to revert back to the things they trust, like human relationships. In the context of marketing, this gives influencer marketing a major advantage over other digital advertising methods. Following the best practices from leading consumer brands, learn how to harness the power of influence and content consumers trust. Had an amazing time in Nashville! would highly recommend the city to anyone visiting the USA. Previous The Marketing Unicorn – Myth or Reality?